Alan’s Christmas tour continued at the Meekens’ today for our annual Christmas get together with “Uncle” Luke and Amie. Luke’s legendary gifts for Alan over the years — ranging from blocks to Tinker Toys to Kinects to Legos — always encourage Alan’s creativity. 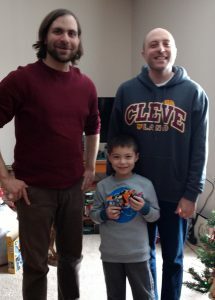 This year the gift was a Lego 3-in-1 motorcycle that Alan built right after opening it!